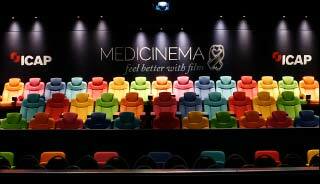 MediCinema builds, installs and runs state-of-the-art cinemas in hospitals and places of care, giving patients and their families the magic and joy of a night at the movies together. 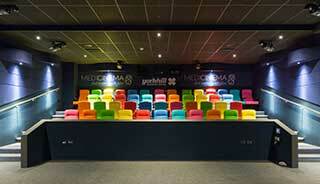 MediCinema brings the real benefits of cinematherapy to patients and their families throughout the UK. 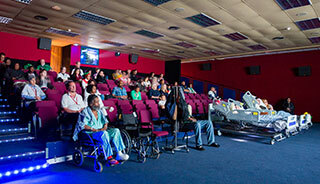 We do this by building, installing and running state-of-the-art cinemas in hospitals and other places of care. Our MediCinemas are fully equipped with the latest technology, including Dolby surround sound, RealD 3D technology and large silver screens, and we use the same architects and suppliers as those used by mainstream cinemas so they look and feel like any other cinema. Thanks to the support of the film industry, we show current releases so patients don’t have to miss out on seeing the latest blockbusters just because they are in hospital. Many patients comment that this helps break the ice with friends when they visit, as it gives them something other than their condition to talk about. 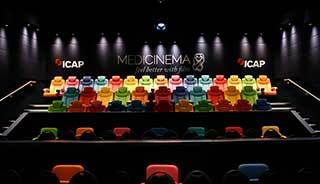 Our cinemas are as much built for a healthcare setting as they are to give a fully immersive cinema experience. No-matter if a patient is in a wheelchair, attached to a drip or even unable to leave their bed, we are able to welcome them, and to ensure their safety throughout the film, we hire two NHS nurses for every screening. 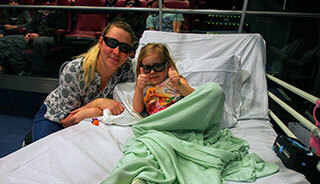 Thanks to the support of our donors, our screenings are completely free for all patients and their families. We have six MediCinemas which are located in health facilities throughout the UK. Through these we run 21 screenings a week, and in 2017 we delivered 23,700 cinema experiences to patients and their families. By 2025 we plan to double the number of MediCinema sites and triple the annual number of people we reach. *The Ministry of Defence has recently moved the Defence Military Rehabilitation Centre (DMRC) Headley Court (the site of the Royal British Legion MediCinema) to a new site at Stanford Hall, Loughborough. We hope to open a MediCinema in the new DMRC once the clinical facility is fully settled and an appropriate site for the MediCinema has been agreed. St Thomas' Hospital has a reputation for clinical, teaching and research excellence. *Our MediCinema in St Thomas’ Hospital is currently being refurbished. Once this work is completed it will have 160 seats. The Newcastle RVI has been providing healthcare to the communities of Newcastle and the North East for over 250 years. As part of the Newcastle Upon Tyne Hospitals NHS Foundation Trust, the healthcare services they provide range from emergency medicine to a pioneering burns unit and an innovative dermatology unit. Several departments at the RVI are officially designated regional centres of expertise. Some enjoy international reputations, like the Neurosciences Centre, which treats people with illnesses affecting the nervous system, including the brain and the spinal cord and The Great North Children's Hospital (GNCH) which is one of only 14 major children’s medical centres in the UK. 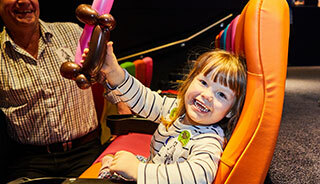 Our MediCinema at Southern General opened in July 2015, after moving from its original place within Yorkhill Children’s Hospital, and is one of the latest additions to the MediCinema Family. 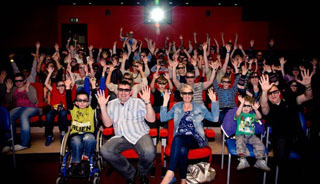 Our original MediCinema operated within Yorkhill Children’s Hospital for 8 years, until June 2015 when we closed the doors for the final time and moved our MediCinema to the new campus where we will screen for both adults and children. The new campus replaces the Royal Hospital for Sick Kids at Yorkhill, the Southern General Hospital, the Western and Victoria infirmaries and the Mansionhouse Unit. Operated by NHS Greater Glasgow and Clyde, it incorporates two accident and emergency departments, one for adults and one for children, a maternity hospital, and state-of-the-art laboratory services. The Serennu Children's Centre is an integrated, holistic children’s centre which provides services to children and young people with a disability or developmental difficulty between the ages of 0 and 18. The centre is purpose-built to allow children with complex disabilities to receive treatment, care, information and consultation all under one roof, eliminating the need to travel to numerous care facilities. The centre also acts as a support network for the whole family unit, enabling them to socialise together through a range of leisure facilities, which include a wheelchair sports area and swimming pool as well as the MediCinema. Guy’s Hospital, part of the Guy’s and St. Thomas’ NHS Foundation Trust, is one of London’s best-known teaching hospitals. Counted among the UK's busiest and most successful foundation trusts, it has a long history of clinical excellence and high quality care. Together with St. Thomas’ Hospital, Guy’s Hospital provides a full range of hospital services to local communities in the London boroughs of Lambeth, Southwark and Lewisham, with specialist services for patients from further afield, including home to an advanced centre for cancer diagnosis and treatment which will create a hub for cancer services in South East London. The MediCinema was generously funded through ICAP’s famous Charity Day, which sees 100% of revenues and commissions generated on just one day of trading donated to charities each year, and by Guy's and St. Thomas' Charity. Chelsea and Westminster is one of the leading hospitals in the UK and treats more than 360,000 patients a year. 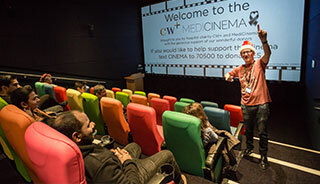 MediCinema has partnered with CW+, the hospital’s charity, to bring the CW+ MediCinema to Chelsea and Westminster Hospital. 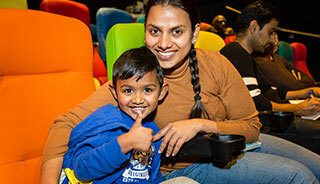 Together our aim is to delight thousands of patients of all ages through the magic of film and bring families separated by illness together through an enjoyable shared experience. Our CW+ MediCinema also acts as a centre for CW+'s music, dance and theatre projects, along with providing a centre for training the next generation of doctors in life-saving surgery and care. In July we trialled a new way of evaluating our service across our five hospital sites. For a two week period we asked everyone who came to a MediCinema screening to complete a questionnaire and received 133 responses. We repeated the evaluation in December when we received 175 responses. We will continue to run these surveys twice a year – keep an eye on the News section of our website for our latest results. MediCinema is all about the people we help – the patients living with illness and the families caring for them. We’re grateful to every patient who shares their inspiring story with us. MediCinema is managed by a small staff team of four head office employees and six regional staff members, supported by around 135 volunteers and our healthcare and film industry partners. In partnership (and thanks to!) Vue, we have recently launched a new advert to promote MediCinema which features our patron, acclaimed British actor, Simon Pegg. The CW+ MediCinema in Chelsea and Westminster Hospital, run in partnership with the hospital charity CW+ and where the advert was filmed, has provided a welcomed escape for Sienna during her long-term medical treatments. Having endured open heart surgery and battled life-threatening bouts of sepsis, Sienna was also admitted to hospital for 20 months for artificial nutrition given via a central line into the main vein of the heart for 16 hours a day. The film is now being shown before all PG and higher rated films at 86 Vue sites throughout Great Britain. As well as playing a pivotal role in raising public awareness of MediCinema as we approach our 20th anniversary, the advert encourages all Vue customers to make a donation to the charity while buying tickets. This will raise much-needed funds for our work at this exciting time of growth. 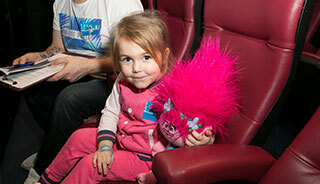 *Sienna is one of many thousands of patients with different conditions each year who come to MediCinema. If you have been affected by the information surrounding her condition and would like support, please contact CDH UK, the support organisation for families of children affected by diaphragmatic hernia. Call their free helpline on 0800 731 6991 or visit their website at www.cdhuk.org.uk. BLISS, the organisation for premature babies, may also be able to help. Their helpline number is 0870 7700 337 or you can visit their website at www.bliss.org.uk.